I was helping my 15-year-old son register for his sophomore classes the other day. That’s when my role as parent serendipitously intersected with my “day job” as a workforce policy researcher. He attends a fairly forward-thinking public school that offers students a wide variety of courses and extra-curricular activities. Since my son is a high-achieving student, he and I were invited to visit a local career technical college that coordinates with our school district to offer applied STEM (science, technology, engineering and math) career programs for qualified students. At the end of the visit, I contacted the school counselor about a question that needled me during the entire visit: in order to continue to meet college preparatory requirements, my son needed to choose between either taking exciting applied math and science courses at the local career technical college or participating in extra-curricular activities, while staying in his regular high school. As a mom, I want the best for my child and for him to have a “normal” social life full of extra-curricular activities. Why should a student have to give up normal and valuable high school activities to be both college ready and career ready? Shouldn’t the high school curriculum prepare them for both? In the well-intentioned effort to provide our children with the best academic knowledge to prepare them for postsecondary education and a meaningful career, we have separated the teaching of how to apply that knowledge to solving real world problems. Why do we separate college preparatory coursework from the applied teaching that occurs in career technical education programs? Why does this occur in both secondary and postsecondary education programs? Why do we make our students and parents choose between college and career readiness pathways at an early age – as if one was completely separate from the other? 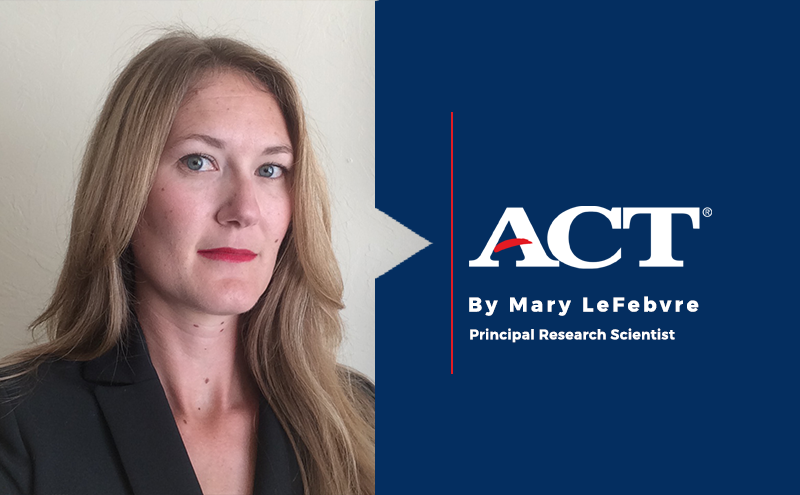 Over the past two years, my work, along with my colleague and co-author Krista Mattern, has attempted to reconcile the similarities and nuances in college and career readiness. We believe that stories similar to my son’s are playing out all over our nation’s schools. And that’s a shame. We believe it is important to ensure that all students are learning the skills they will need to succeed in whatever path they take after high school graduation, and that no student should have to choose between being college ready and being career ready. Our insights and recommendations are summarized in the report entitled, Ready for What? Development of a Hierarchical Framework Linking College Readiness and Career Readiness, which can be accessed for free on the ACT website. We look forward to continuing a robust debate regarding the best path we can offer our children for readiness to achieve both college and career success.